I grew up in southern Connecticut within a creative family, and spent much of my time drawing and observing my mother's colorist landscape paintings that hung on the walls of our home. Responding to my physical surroundings and the visual world became fundamental to my life at an early age. As such, I am still drawing and now a practicing artist based in Western Massachusetts. 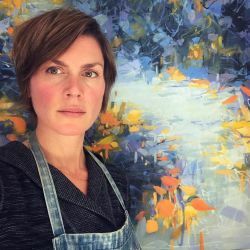 I received my MFA in painting from the Pennsylvania Academy of the Fine Arts, and BFA in painting and drawing from the University of New Hampshire, in addition to studying at Studio Art Centers International, in Florence, Italy. Following an artist residency at the Vermont Studio Center in the fall of 2006, I packed my car and moved to Vermont. Vermont's rugged beauty, the quietness and vast open farmland and space that surrounded me there, were uniquely inspirational to me. I've not made me way down to Western Massachusetts, on the border of Vermont, where I live with my my three children. Since 2007 I have actively exhibited my work throughout New England and beyond. My work has been featured at Fitchburg Art Museum, Green Mountain College, Kyoto Seika University in Japan, Emory University, Northern Arizona University Art Museum, and Rogue Space Chelsea, New York. Last but certainly not least, since 2012 I have been curating solo, two-person and group shows, which include contemporary painters, photographers and mixed media artists from the U.S. and U.K. and take great pleasure sourcing, promoting and sharing inspiring artwork from artists throughout the country.